This Digital Young Writers Camp for rising 4th through 6th graders will explore the use of storytelling through a variety of digital tools. We will use youtube video editor, imovie, and many other iPad apps for creating literacies and blogging spaces such as edublogs, weebly or kidblog for sharing our creations in ways that promote digital citizenship. The camp will conclude with a collaborative “Choose Your Own Adventure” story to be shared in a digital space and a Family Scribe group where families can participate in a writing experience. The camp fee is $175 per student writer. Please pay only the $25 registration fee when you apply. Climb aboard and come explore the art of storytelling! Create original storybooks focusing on both image and word. Innovative and exciting summer creative writing camp designed for young writers who want to learn what it takes to write and illustrate their own stories. Students will develop an original story, while working to create a distinct and personal style. Writers will focus on developing plot, characters, setting, and theme. This camp is being offered twice at both the elementary and middle school level. Writers can sign up for either Session 1 (elementary or middle) or Session 2 (elementary or middle). For more information about this camp, contact Alicia Datz at 252-227-6022 or by email at g8rali [at] gmail [dot] com. The camp fee is $125 per student writer. Please pay only the $25 registration fee when you apply. The camp fee is $200 per student writer. Please pay only the $25 registration fee when you apply. We will offer a camp that will challenge young writers to explore descriptive writing. Daily activities enable the exploration and free expression that help make the writing experience fun and rewarding. Daily journal writing, writing marathons, and writing workshops are blended with activities in other creative arts such as drama, music, photography, and drawing. Young writers engage in crafting a variety of writing forms, such as poems, autobiographical/ character sketches, short stories, and observations of nature and people. Established on October 20, 2009 by the National Council of Teachers of English (NCTE), the National Day on Writing celebrates composition in all forms – from stories, poems, and letters to text messages, videos, and audio recordings – and demonstrates how writing is a vital part of our everyday lives. Thousands of writers from across the country recognize the National Day on Writing with local events, including write-ins, talks by local authors, and poetry slam celebrations. Last year, nearly 200 local school children and teachers joined us on campus for the first annual National Day on Writing celebration at ECU. To learn more about last year’s celebration, click here. This year, we’re planning another exciting celebration of writing, and if you’re reading this, we want you to be part of it! To simplify field trip planning and make the event accessible to as many local K-college students as possible, we have scheduled our on-campus events for Friday, October 19. However, we plan to host community activities that will be open to the public on Saturday, October 20 as well. We will host two celebration blocks, morning and afternoon, that include two activity sessions each. Blocks will be open to registered K-College groups. Groups attending both blocks will be invited to eat on campus, and dining facilities will be available. While celebration activities will be free, attendees will have the option to pre-pay for a meal or bring their own. Attendees will participate in fun and creative activities that include digital storytelling, social writing, meeting published authors, and creative workshops. Educators will be able to register their classes beginning in August. If you want to bring a group to campus, you may apply now for registration. Information gathered from the applications will help us tailor our planning efforts better for potential attendees. We will notify applicants of acceptance status within one week of application, and we will accept applications through September 21 or until we reach our maximum capacity. We will also present the second annual Tar River Writing Project Gallery, in which we will display original works by ECU students, TRWP young writers, TRWP members, and members of Eastern North Carolina communities. We are currently seeking partnerships with local community centers and businesses to plan and host community events. If you, your business, or your organization are interested in partnering with us for a community event, please send us a message through our Contact Us page with the subject line “NDOW Community Celebration Partnership Recommendation”. We’d like to thank the following folks for helping us make our celebration awesome! If you are interested in donating funds or supplies OR if you have an idea for an event, please send us a message through our Contact Us page. Include NDOW 2012 as part of your subject line. In Fall 2011, the Tar River Writing Project, the University Writing Program, and the English department at ECU joined with colleges, universities, schools, and communities all over the country in celebrating the third annual National Day on Writing (NDOW). Through the efforts of the National Council of Teachers of English (NCTE), October 20 became a federally recognized day for celebrating writing in all its forms. Two Pitt County Schools accepted our invitation to celebrate the National Day on Writing at ECU. Jennifer Anderson brought seventy-two fourth grade students and three teachers from W. H. Robinson Elementary to campus that Thursday morning, and Rob Puckett of J. H. Rose High brought over 90 high school students and 6 teachers that afternoon. Director and TRWP member Stephanie West-Puckett transformed the First-Year Writing Studio into a one-day Digital Studio to offer our visitors a place to explore four online writing tools: Storify, Xtranormal, VoiceThread, and Wordle. English graduate assistants, who normally help our first-year students negotiate the complexities of the writing process, demonstrated their flexibility by helping students negotiate these new technologies. The Digital Studio provided a space for elementary and high school students to compose fun and original works, engage in thoughtful discussion about copyright, and celebrate their creativity. Thanks to Dean of Academic Library and Learning Resources Larry Boyer and Assistant Director of Public Services Mark Sanders, we were able to host multiple events in Joyner Library. In the morning, volunteers Sam Settimio and Jewell Williams introduced young writers to Beedle the Bard, as Will Banks performed a selection from J. K. Rowling’s Tales of Beedle the Bard for several groups. Following the reading, students participated in a writing marathon during which they wrote their own tales. In the afternoon, high school students were captivated by Rick Taylor’s readings of an excerpt from The Princess Bride. They were so inspired that one group requested more time to write at the cupola before moving into the Digital Studio. English faculty member Randall Martoccia contributed Halloween-themed prompts designed for students in both age groups. In another session, we introduced the high school students to two professional writers, who are also graduate students in the English department. Brandon Sneed, a sports writer, and Amber Carpenter, a political poet, volunteered their afternoon to engage in a fruitful dialogue with our visitors about what it means to be a professional writer. We also established two student writing exhibits in Joyner: a gallery sampling in the study area beside the circulation desk and a full gallery in one of the library conference rooms. Assistant Director of the University Writing Program Kerri Flinchbaugh curated the National Day on Writing Gallery with help from volunteers Jenn Sisk and undergraduate student Jaden Little. Works on display included several issues of The Rebel and Expressions, two of ECU’s publications that showcase student writing, as well as academic, professional, and personal writing samples from the graduate students working in the First-Year Writing Studio. Joanne Dunn brought her first-year composition students to view the gallery, and they enjoyed reading student work and contributing short videos to the National Writing Project’s “Why I Write” campaign. While students enjoyed all of these activities, the favorite activity of the morning was the graffiti wall they built at the station led by Cyndi Gibbs, an art instructor from Coastal Carolina Community College. Three graduate students – Therese Pennell, Michael Brantley, and James Cardin – volunteered more than half of their work day to make this potentially messy station a success. Students enjoyed learning about using symbolism to express themselves, collaborating to create a unified collaborative work of art through writing, and playing. In light of the successes, we’re starting early with grand plans for next year. We would like to expand the celebration to include lunch for students so that we can bring them to campus for the entire day, which will provide more time for them at each station and a greater variety of writing activities to engage in. We also want to spread the celebration campus wide and include more events for on-campus and distance education students. Click here for the latest news on the NDOW 2012 celebration. Please help us celebrate by donating time, resources, or some of your own writing to make ECU’s Second Annual NDOW celebration a success! To volunteer your time: For NDOW 2012, complete the volunteer registration form. To volunteer for other activities, send a message through the Contact Us page. Include the event and times for which you are interested in volunteering. We are in the process of rebuilding the Tar River Writing Project Virtual Gallery. This summer the Tar River Writing Project will sponsor several camps for young writers in Pitt County and the surrounding area. We welcome writers at all ability levels who want to join a fun and creative writing community this summer. Each camp offers writers the chance to develop writing and digital literacy skills and to build a writing community with other writers from across the county. Students from public, private, and home school environments will find an engaging and instructive experience with writing. We will continue to accept applications until camps are full. At the time of application, a $25 non-refundable application fee is due. The application for the Wilderness Writing camp is $50. Parents who apply by will be notified by email if their child has been accepted. Full payment is due the earlier of one week from the email notification or one business day before camp begins. Registration fees for each camp include instruction and supplies for the duration of the camp and a commemorative T-shirt. If the camp you are interested in is no longer accepting applications, feel free to add your application to the waiting list by clicking the link below. The registration fee is waived for waiting list applications. Tuition payment for applicants accepted through the waiting list is due June 1. If your child is accepted after June 1, payment will be due within one week of acceptance or by the first day of camp, whichever occurs earlier. For rising 6th – 9th graders, we will offer a camp in which writers will explore their identities through reflection and examination of their current and past environments. Through a variety of writing, photography, and digital activities, writers will compose a digital autobiography which will contribute to a collection that the writers can be proud of. Parents will be invited to the last two hours of the Friday session so students can share their digital autobiographies. For more information about this camp, call 910-546-7484 or email bethelc99 [at] students [dot] ecu [dot] edu. The camp fee is $150 per writer. Please pay only the $25 registration fee when you apply. We are no longer accepting applications for this camp. For rising 9th – 12th graders. Writers make their marks on the world — whether the writing is in story form or poetry, art or video. Increasingly, people are finding their voices in online spaces, from Facebook and Twitter to Pinterest and YouTube. During this Young Writers Camp, we will explore creative self-expression by composing original works of digital writing. Writers will compose a collection of pieces to make their own autobiographical, multimedia videos, which they can use to “tag” a digital map of Greenville and the surrounding areas. During the camp, participants and parents will be involved in discussions about appropriate sharing and privacy issues involving our digital footprints. The camp will provide opportunities for student writers to develop skills in Writing and Digital Photography while working with exciting computer programs like Adobe Photoshop, Garageband, and iMovie. For more information about this camp, call 252-717-5352 or email puckettr [dot] rose [at] pitt [dot] k12 [dot] nc [dot] us. The camp fee is $250 per student; this is a two-week camp. Please pay only the $25 registration fee when you apply. Write Here! Write Now! (High School) – In Session! The camp fee is $200 per student writer; this is a two-week camp. Please pay only the $25 registration fee when you apply. For rising 9th – 12th graders, we will offer a camp in which participants will take one overnight camping trip during each week to explore North Carolina’s coastal and mountain wilderness and write about their experiences in the wild. Classroom time before and after trips will prepare students for camping, hiking, and wilderness exploration and guide them in developing an individual multi-media travel blog as well as a collaborative online project which “geo-tags” their writing in a Google Map Layer to the locations we visit. For more information about this camp, call 252-737-1089 or email westpucketts [at] ecu [dot] edu. The camp fee is $350 per student writer; this is a two-week camp. Please pay only the $50 registration fee when you apply. Campers will also need a backpack, tent, sleeping bag and pad. Camper can furnish or rent items separately for under $10 each per trip. Looking to awaken your creativity? The Tar River Writing Project is proud to announce a brand new workshop every year for middle school writers! Come and join your friends whose taste for the frightful will come alive at the Young Frighters Camp! In Summer 2011, the TRWP young writers camp offered young writers the chance to be the next Neil Gaiman (The Graveyard Book), R. L. Stine (Goosebumps), or Stephanie Meyer (Twilight), whose fanciful tales of the spooky, other-wordly, or undead have captured audiences around the world. For more information, contact the Young Writers Camp: ywc [at] trwp [dot] org. Summer 2011 brought together a great group of young writers. Are you ready to write? If you’re in high school and you love to write, our young writers camp is opportunity you’ve been looking for! 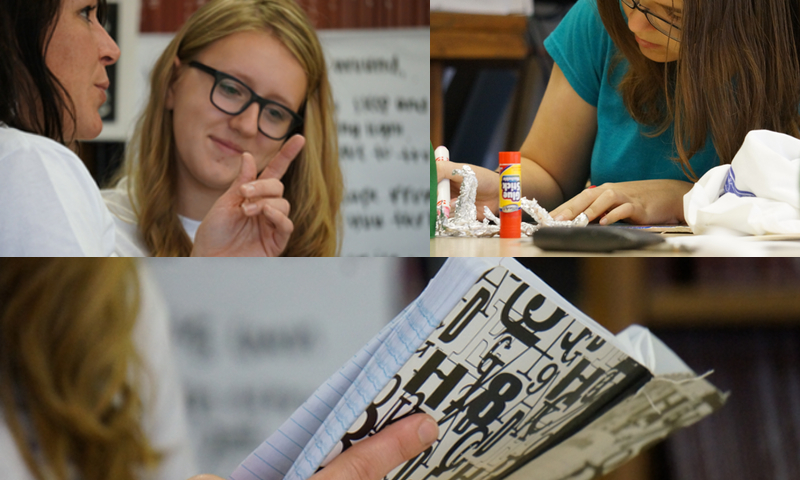 Writers joined Ms. Ali Datz and Ms. Melissa Denton on the campus of ECU for 8 days of exciting activities that awakened the creative writers within. Are you a budding poet? Do you have a great story in your head that you’ve been dying to get on paper? Looking for a chance to write that cool screenplay you’ve been talking to friends about? If so, our young writers camp is your chance to meet other young authors, work on your pieces, and grow as a writer.